The Pontiac Fiero is literally the Rodney Dangerfield of the car world- it get's no respect. 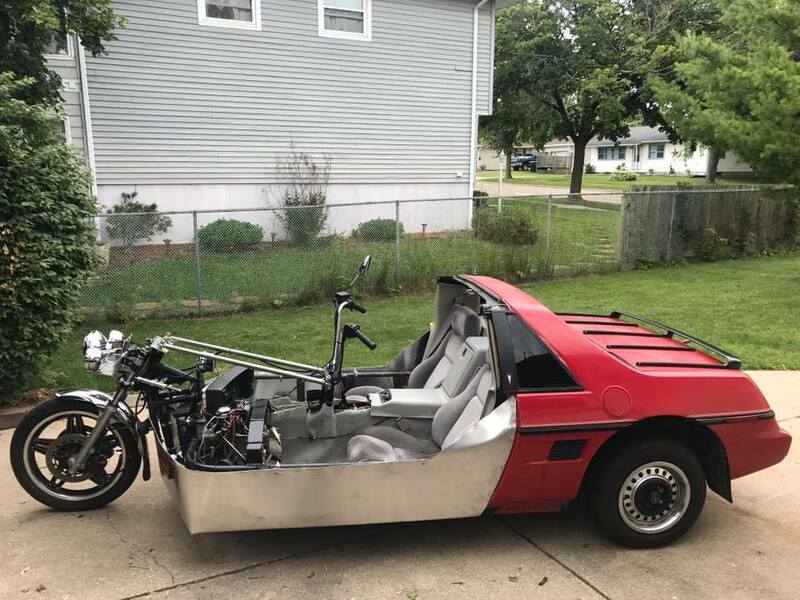 In high school, the Fiero was voted the car most likely to be turned into something else. DT has featured too many Fiero based replica Ferrari's or Lambo's to count, but today's feature goes into a completely different direction. 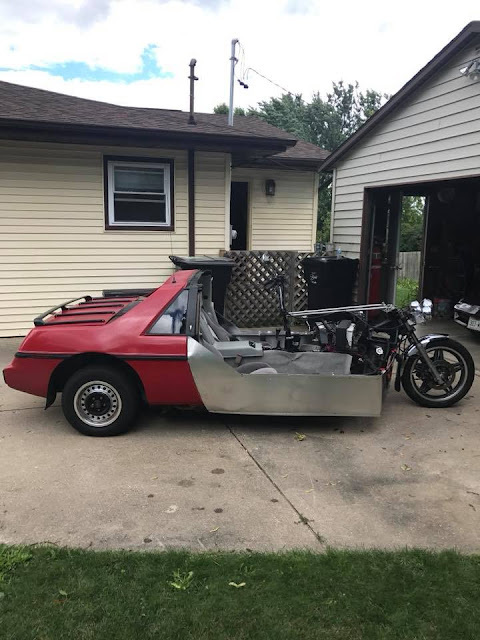 The back half of a Fiero has been mashed up with a Honda motorcycle front to create a bizarro trike that would look quite at home in Mad Max movie set. Find this 1984 Pontiac Fiero for sale in Beloit, WI for $2,000 via Facebook Marketplace. Tip from Eric. It seems oddly appropriate that the POS GM iron duke 2.5 four cylinder is powering this creation. Would it look better or less Terminator-like if they rattled can painted the front sheet metal red to match the GM paint? Cory found out the cause of the suspension clunking- the bottom rear shock bolts were loose! "Radio/laptop" as in "we hacked up the front, and there's nowhere for the radio to go but on your lap". Would it look better if they rattled can painted the front sheet metal red to match the GM paint? Couldn't make it worse, nothing could make it worse. Where is the front half? 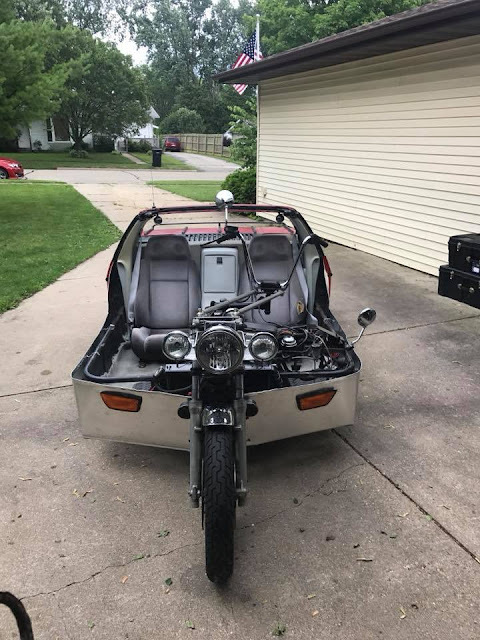 Hopefully trike with (2) front wheels (like a can-am spyder) is in the garage. I will never get this type of vehicle. A h h h Fike It ! I'm trying to figure out the steering situation... I don't think the handle bars turn left and right on a center axis as they once did. Unless there's some complex articulation built in that's not visible. It looks to me like you would have to turn the thing by swinging the whole handle bar to the left or right as you would using a tiller on a boat. If that's the case, this thing is not just stupid, it's insane. 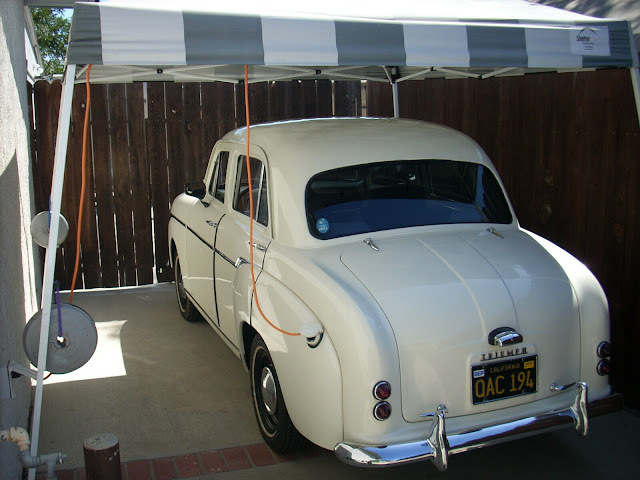 Plus you'd likely elbow your passenger in the face every time you made a left turn. Nevermind… now I see the mount coming off of the center tunnel. I guess it's only just stupid.